Perhaps delirious from their own success, the minds at Heinz that brought us Mayochup and its subsequent descendants have once again tested the boundaries of condiment crossbreeding. Somewhere, hidden deep amongst the catacombs of Heinz headquarters, these mad food scientists give free rein to even the basest of instincts, unchecked, ungoverned by the tenets of civilized society. And lo, what they have wrought. 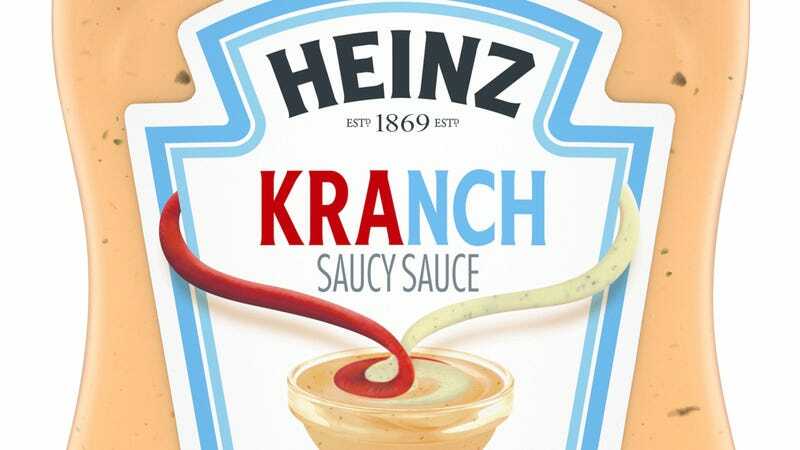 The newest Saucy Sauce: Kranch. KRANCH. KRAAAAAAAAAAAAANCH. This ketchup and ranch combo with the TRONC-adjacent name is the latest in this particular line of sauces. Sorry, I mean Saucy Sauces. Those would be hummus + ketchup, Worcestershire + mustard, Sriracha + ranch, mayonnaise + maple syrup, and butter substitute + ranch. Anyway, Kranch arrives this month and will set you back $3.49 if mixing your own ranch and ketchup doesn’t appeal, but the idea minus the physical exertion sounds great.